Bill Means was born on July 13, 1935, in Springfield, Missouri, and grew up in Kansas City, Missouri. He enlisted in the Aviation Cadet Program of the U.S. Air Force on March 22, 1954, and was commissioned a 2nd Lt and awarded his pilot wings at Williams AFB, Arizona, on January 19, 1956. After completing instructor pilot school at Craig AFB, Alabama, Lt Means served as a T-33 Shooting Star flight instructor with the 3645th Pilot Training Squadron at Laughlin AFB, Texas, from April 1956 to March 1957, and then as a flight instructor with the 3568th Navigation Training Squadron at James Connally AFB, Texas, from March 1957 to December 1959. He then completed RB-66 Destroyer Combat Crew Training before serving with the 30th Tactical Reconnaissance Squadron at RAF Alconbury, England, from April 1960 to June 1963, followed by service with the 16th Tactical Reconnaissance Squadron at Shaw AFB, South Carolina, from July 1963 to June 1964. Capt Means served in aircraft testing with the 4485th Composite Test Wing at Eglin AFB, Florida, from June 1964 to May 1965, and then with the 4416th Test Squadron at Shaw AFB from May to November 1965. He then deployed to Southeast Asia where he served as an EB-66 pilot with the 41st Tactical Reconnaissance Squadron at Tan Son Nhut AB, South Vietnam, from December 1965 to June 1966, and then from Takhli Royal Thai AFB, Thailand, from June 1966 until he was forced to eject over North Vietnam and was taken as a Prisoner of War while flying his 89th combat mission on July 20, 1966. After spending 2,400 days in captivity, Col Means was released during Operation Homecoming on February 12, 1973. He was briefly hospitalized to recover from his injuries at Maxwell AFB, Alabama, and then served as Air Operations Officer for the 363rd Tactical Reconnaissance Wing at Shaw AFB, South Carolina, from October 1973 to June 1974, followed by Air War College at Maxwell AFB. 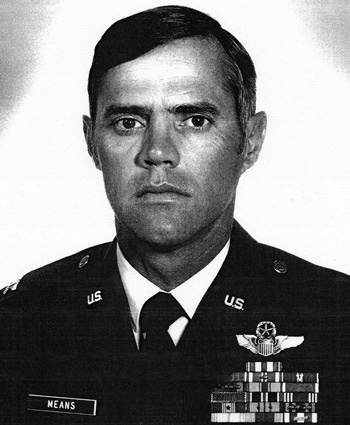 Col Means next served as Commander of the 354th Field Maintenance Squadron and then as Assistant Deputy Commander for Maintenance of the 354th Tactical Fighter Wing at Myrtle Beach AFB, South Carolina, from June 1976 to November 1978, followed by service back at Shaw AFB, where he retired from the Air Force on April 19, 1980. Bill Means died in June 1986, and was buried at Arlington National Cemetery. 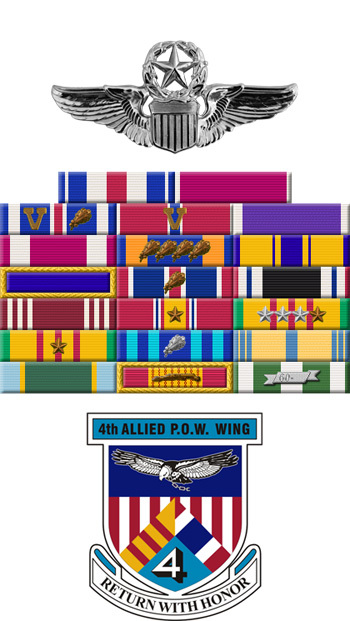 For the period 20 July 1966 to 30 July 1966: This officer distinguished himself by gallantry and intrepidity in action in connection with military operations against an opposing armed force during the above period while a Prisoner of War in North Vietnam. Ignoring international agreements on treatment of prisoners of war, the enemy resorted to mental and physical cruelties to obtain information, confessions, and propaganda materials. This individual resisted their demands by calling upon his deepest inner strengths in a manner which reflected his devotion to duty and great credit upon himself and the United States Air Force.